← Moral behavior: divinely inspired or evolved? This article appeared in the Youngstown Vindicator today. And it wasn’t in the “Religion” section either. I think it’s the perfect example of how mind-dumbing stupidity is so easily spread in 21-century America. Newspaper editors are ever so willing to include bovine excrement like this along with the traditional, mediocre news stories that they conveniently nab from their AP wire. About a decade ago scores of Campbell, OH residents gathered around a local Catholic Church every day for about a month to witness the miracle of the Virgin Mary as she made her daily “appearance” on the side of the church building. So many people showed up on some days that several police officers were summoned to control traffic! The church shaman came out every day to ask the assembling morons to please disperse, telling them that it was just a bizarre water leak from a broken pipe that was soaking its way through the brick wall. His voice fell on deaf ears (and vacant cranial cavities). I think it really says something about the level of idiocy in a church crowd when the head shaman turns out to be the only voice of sanity and reason. As I’ve long maintained: we’re shovilin’ bovine excrement against a bovine excrement tsunami. This entry was posted in Uncategorized and tagged miracles, morons, mother casini, pope francis, prayer, youngstown vindicator. Bookmark the permalink. Below is an excerpt from the article and video. So many doctors and health care professionals involved were of different faiths, OR NO FAITH from Muslim to Hindu to Jewish, to Catholic, to Baptist, to Protestants, to Methodist. They were all involved and everyone said this wasn’t because of anything we did. Everyone said, your son was touched by the hand of God. Again it was just faith,” said Sebest. Yes indeed, I am well aware of how a 6YO mind works; unable to explain something rationally and scientifically but still insist having on an explanation that you can accept? No problem at all, just listen to the nutjobs that claim god did it! Gee, I wonder who gave all those innocent little newborns at St. Jude Hospital brain tumors, killer blood diseases, missing limbs and conjoined heads. Obviously you have not reviewed the 6YO strategy. May your binky keep you warm. How did a person like you end up reading a skeptic’s blog in the first place? You sound like you just came out of church, for christ’s sake. Before reading and appreciating the writing of Rev. ElMundo, you need to deprogram yourself or have it done professionally, of all dogma. The reverend is not for freshmen skeptics, or people who are only half-cleansed of the religious diseases, it’s true. Come back at a later date and see if the writing seems more palatable after you become more rational. Good luck. No blessings, please. Please do your research before posting mis-information. You have posted completely wrong information on your blog. 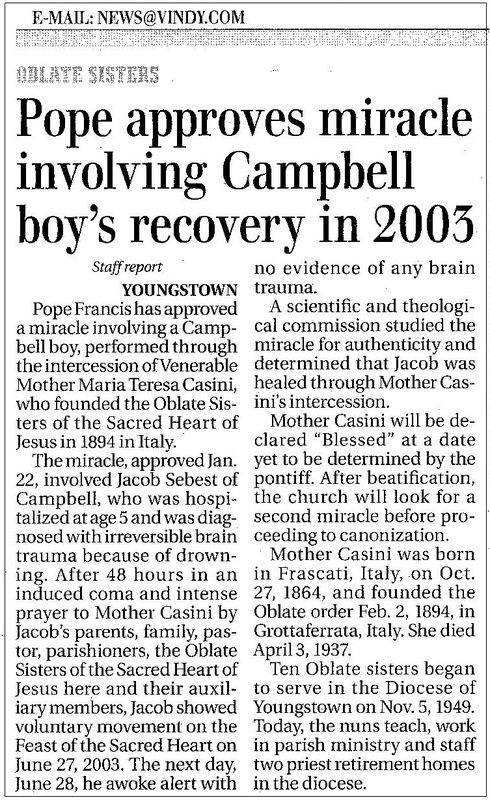 The episodes of the glowing Virgin Mary at St. Joseph the Provider church in Campbell, Ohio is a completely different story than the Jacob Sebest miracle article published in The Vindicator in January 2015 (the one you posted above). Here’s a little background on Campbell, Ohio. Campbell was a town of about 10,000 in the 70’s and 80’s. It was filled with immigrants from all over the world whose faith (Catholic, Russian and Greek Orthodox, Jews, Methodist, Baptist, Jehovah’s Witness, etc.) permeated the city. It was the most spectacular city in which to grow up. I wish you would have been able to grow up there too. You would have been hard pressed to form beliefs that didn’t include God as the center of your life. It always amazed me how so many different people from all walks of life lived cohesively in this small town. Other than to say that none of what I offered was inaccurate I offer no other comment because what you offered here clearly indicates that there is nothing to gain for either you or myself from what I might offer. Instead, I think it’s best that I employ the 6YO strategy. Ever since I learned of the strategy a couple of weeks ago, I am convinced that it is the only effective method of responding to these sorts of replies. You’ll find an excellent description of this strategy at the link below. Thanks you very much for your reply. That was very helpful. May your day be blessed by the warm embrace of his noodley appendages.